Landing in Baku I wasn’t expecting the baby booming tourism attraction that will soon grow into the Caucuses version of Dubai. Much like that United Arab Emirate city, Baku can overwhelm you fast to the point you might leave feeling like you haven’t seen anything. To begin to cut in to Azerbaijan’s capital city you’ll need to dissect it into digestible pieces so you can begin to see what’s actually behind all of the rapidly rising steel and flowing concrete. The “Icheri Sheher”, Inner or Old City, is a deceptively quaint area of Baku located behind its original fortress walls. (It also happens to be a UNESCO World Heritage Site.) In the Inner City is where you’re likely to end up and even if you don’t, it contains several small but interesting sites like Qiz Qalasi (“Maiden’s Tower) where you’ll find exceptional shots of Baku from above, all within walking distance. From there you can get to the Palace of the Shirvanshahs, in a walk less than 10 minutes to see this realtively large complex that was completed around the year 1585. Some of the sections are less spectacular than others but yours eyes shouldn’t miss the underground tombs or the doors of the mausoleum. There are extra fees to bring cameras into the palace area unless you *cough* keep them inconspicuous when purchasing tickets. Eating In The Inner City: The restaurants and food within the walls are varied but tend to be the upper-class no-locals-eat-this-stuff variety; with one notable exception. 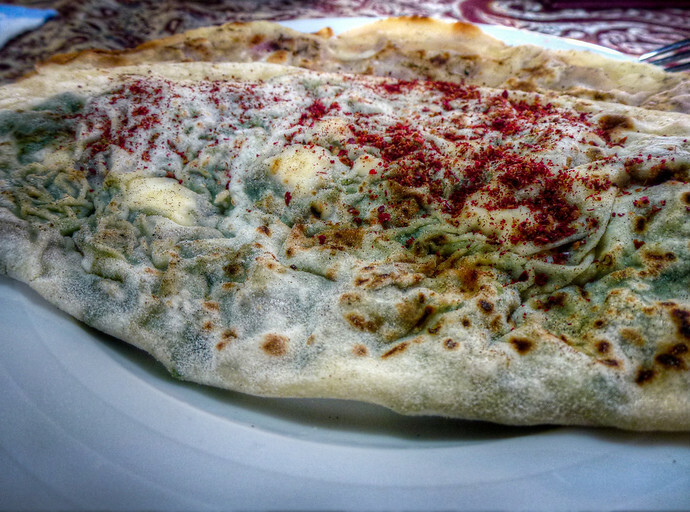 Tendir sits at one of the entrances of the fort walls and serves relatively inexpensive – yet damn good – Azeri cuisine, including fresh bread cooked in a stone over right outside. It doesn’t seat more than 20-25 people total so get there are bit early or late to make sure there’s enough room for your group. That’s hardly all to there is to the Icheri Sheher, such as the Miniature Book Museum, which my nerdy side loved and yours probably will too if you have one. A touching tribute to many of those killed in several wars, including during fighting against the Soviet Army at the end of World War I. 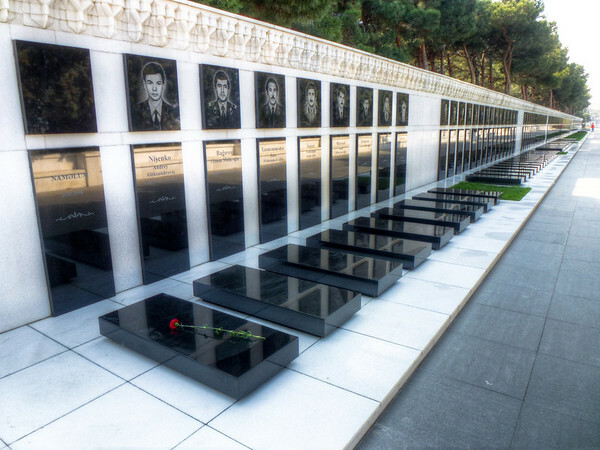 There is also a memorial to 1,130 Turkish soldiers killed protecting Baku during that time. Martyr’s Lane (“Shehidler Khiyabani”) is thought to have over 15,000 bodies in its cemetery, though its not certain as it was destroyed during the 1920s. Today, you can see the line of hundreds killed in the 1988-94 Nagorno-Karabakh War, including the graves of several journalists killed covering the fighting. I’d recommend arriving at sunrise (maybe your bladder can help wake you up) or an hour before sunset for some great photo opportunities of the Caspian Sea. Then you can take the nice, very-downhill walk down by the water. Those of you traveling with children will especially appreciate all of the rides along the way. But around Baku are where some of its other popular sites are; most of which may be worth skipping depending on your tastes. The much famed Yanar Dag (“Burning Mountain”) was disappointing. I was expecting a mountain engulfed in flames only to find a boulder on fire. A fire that has been burning for over 50 years, fueled by natural gas deposits beneath the surface. The Atashgah Fire Temple, over 1,000 years old, is also a site that I felt similarly about. The history of the structure, and its possible Hindu roots are fascinating however, though without a thorough brush up on its background, you may leave feeling unsatisfied. Once you’ve seen both, it’s hard not to be reminded of Dubai in Baku. Except that it’s like what I imagine Dubai was 15 years ago; making Baku’s surface still so very transparent. The way the government’s tourism direction is headed however makes that window a rapidly closing one. While I enjoyed surfing down the farting mud volcanoes in Gobustan, it was the serendipity that happened along the way that made bouncing around Baku memorable. Wow, the skyline has changed a bit since I visited in 2004! I can imagine, *everything* seems under construction! Nice to know about Azerbaijan as i am visiting for 4 days next month. will try as much as things mentioned. Happy to hear the timing worked out just right, have a good trip! Nice round-up of a city and country that I really know very little about. It appears to really be a city where the ancient contrasts with modern buildings and fresh technology. Great to see a delicious, inexpensive restaurant still within the inner city! Though that balance is shifting in favor of the new, quickly as well. But if you ever visit, don’t miss Tendir. One of those places to eat that just clicked and think you’d enjoy. I agree on the sights around Baku, only Gobustan interested me, mainly for my driving getting most of his leg stuck in a farting volcano, and the Roman inscription near the petroglyphs, purportedly the easternmost such inscription know in the world. That must have been a messy, messy ride back! 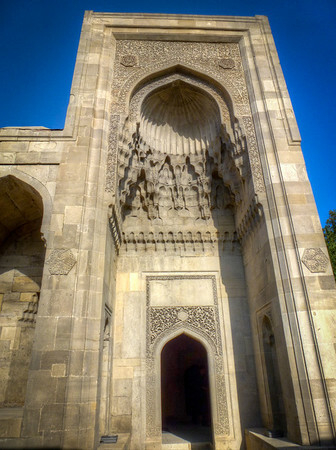 Azerbaijan isn’t on most travelers list, so it was good to learn about. I will certainly think about visiting myself now! I find these former Soviet Republics fascinating – will have to add this to the list! The political and cultural dynamic in each of these countries is fascinating, I don’t think you’ll be disappointed. O man, Baku looks awesome. I definitely have to get over there at one point. It seems there is a growing juxtaposition between the old and new which seems cool to witness. I wonder when those modern buildings will be built. I bet they’re already done, everything is happening so fast there! Have not visited all the sights mentioned above. Totally agree and confirm that Tendir is a great place to eat in the center. Food is very good and not expensive. I was very impressed by the way they make bread. Had never seen this before. You’ve got an interesting blog and i can see you are on a journey to visit every countries in the world. How many have you visited so far? It must be great fun for you. 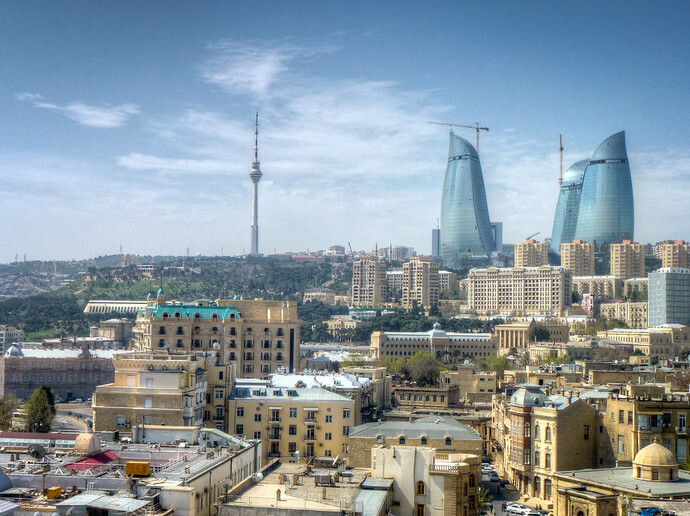 Baku is one of the most important tourist destinations in the Caucasus, with hotels in the city. You must really had a blast there cause it is one of the most expensive cities in the world. I’m not sure there’s a correlation there between cost and enjoyment, at least for me. Its interesting that not many people know about the great places of Azerbaijan. Nice post on what to see in the place in just 3 days. I suspect that will change in the coming years as the country further pushes and promotes its tourism sector. Keep in mind, that most of the country budget is spent purely on Baku, while the rest of the country is still in the ‘middle ages’. The latest Eurovision, triggered conversion of Baku into a really beautiful city. I would love to see it know an compare it to my memories from the visit in the middle of 90-s.
First photo is just astonishing. Though I can imagine now the city is completely different, at least in appearance, to what it was in the 1990s.